Pipeline :: Sapience Therapeutics, Inc.
Sapience is focused on the discovery and development of peptides that act at the level of transcriptional regulation of oncogenic and immune-modulatory proteins. Our peptides are designed to disrupt specific protein-protein interactions, allowing for targeting of intracellular proteins previously viewed as 'undruggable' due to their lack of enzymatic activity or ligand binding. Our lead program, ST101, acts at the level of transcriptional regulation of Mcl-1 and Bcl-2, and exposure of cancer cells to ST101 causes a marked decrease of these anti-apoptotic factors resulting in tumor cell death. 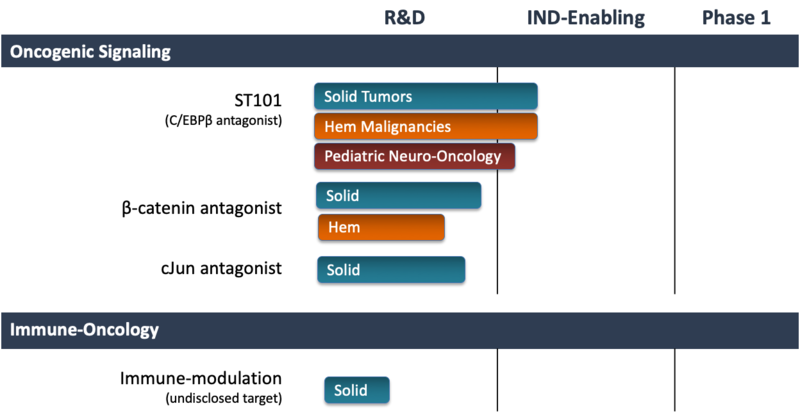 In addition to ST101, Sapience is developing a robust pipeline of peptides to disrupt other well-known oncogenic signaling cascades, as well as peptides that may modulate the immune profile of tumors, turning "cold tumors" into "hot tumors", which will then respond better to immune-oncology agents. ST101 is a peptide-mimetic specifically designed to act as an antagonist to ATF5. ST101 contains a cell-penetrating domain that enables the peptide to efficiently enter the cell and penetrate the nucleus where it inhibits ATF5-driven transcription. Given the expression pattern of ATF5 in cancerous and normal human cells, ST101 is a targeted therapy with the potential to treat many different types of cancer. By inhibiting the actions of ATF5, ST101 is a tumor-specific treatment that sensitizes cancer cells to radiation, decreases a tumor's metastatic potential, and induces tumor cell death by apoptosis. Furthermore, the impact of ST101 on radiation sensitivity provides a rationale for combining ST101 with radiation-containing treatment regimens, such as in GBM. Preclinical data demonstrates ST101 to be effective in a wide array of tumor types, including AML, GBM, melanoma, breast cancer, neuroblastoma, and medulloblastoma. Initial clinical studies will focus on AML and solid tumors, including GBM. Additional oncology indications for which there is already in vivo and/or in vitro data will also be pursued.